We as a society cannot invest enough into mentorship. The two most influential mentors that had a direct impact on me are David Baczewski and Patrick Guinee. I personally desire to thank them for their time and wisdom. It is my desire to foster as many relationships as possible. Simply listen and provide inputs in times of need; build a support mechanism to allow others to grow and garner life experience. I had the pleasure of interviewing Chief Master Sergeant Brian J. Marchessault, the Command Chief Master Sergeant for both the 9th Air and Space Expeditionary Task Force-Afghanistan & NATO Air Command –Afghanistan. He serves as the senior enlisted leader, and advises the Commander on all matters affecting combat operations, health, morale, welfare, discipline and effective utilization of over 2,200 Airman across 2 Air Expeditionary Wings, two Air Expeditionary Groups and an Expeditionary Air Support Operations Squadron encompassing over 101 AFSCs, as well as 9 separate forward and combat outposts in Afghanistan directly engaged in combat supporting Operation FREEDOM STENTINEL and NATO’s RESOLUTE SUPPORT. He also advises and assists with Joint Expeditionary Tasked and individual augmentee Airmen in the Afghanistan Combined Joint Operating Area. Chief Marchessault enlisted in the Air Force in September 1985 with the 60th Military Airlift Wing, Travis Air Force Base, CA. He then joined the Vermont Air National Guard in July 1995. 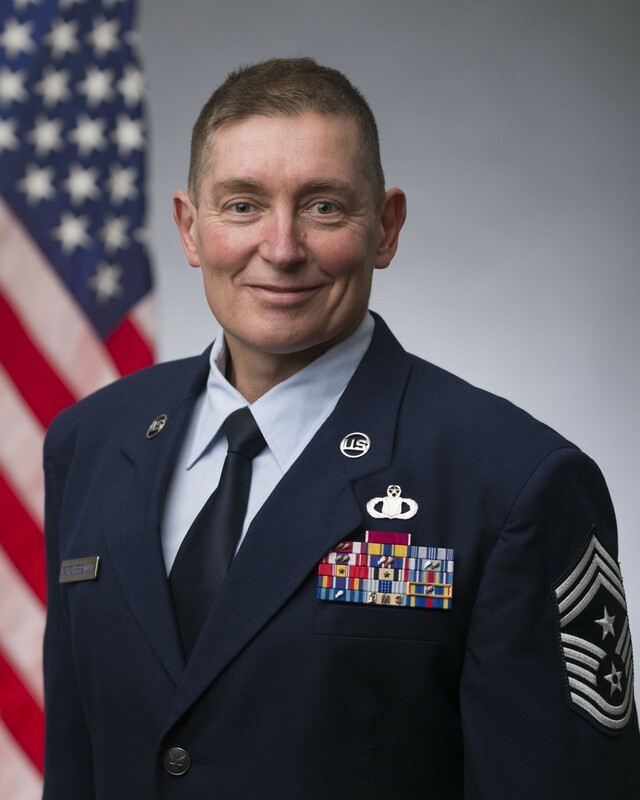 Throughout his military career, Chief Marchessault served as a Command and Control Specialist, Airfield Manager, Operations Superintendent and Wing Command Chief. He was activated in support of Operation NOBLE EAGLE in 2001, and in 2004 deployed overseas in support of Operation IRAQI FREEDOM as the Operations NCOIC, Al Udeid AB, Qatar, and Balad Air Base, Iraq in 2006 and 2007. Recently he deployed to USCENTCOM in support of Operation ENDURING FREEDOM. Before assuming his current assignment, he served as State Command Chief Master Sergeant, Vermont Air National Guard Headquarters. I was raised in Franklin Vermont on a dairy farm along with two brothers and one sister. My parents instilled a deep sense of morals, ethics, and character in all us. The experience and core values of growing up on a dairy farm lives with me today. It was extremely hard work and long hours, and the skills I learned reside with me today. I’m humbled and honored to serve our great Nation; I’m currently deployed to Afghanistan. I hold the position of Command Chief for the 9th Air and Space Expeditionary Task Force-Afghanistan, Kabul, Afghanistan. I am the Senior enlisted Airman for all USAF in Afghanistan and the principal advisor to the Commander 9th Air and Space Expeditionary Task Force-Afghanistan (9 AETF-A) and NATO Air Command-Afghanistan (NAC-A) on all matters affecting combat operations, health, morale, welfare, discipline and effective Utilization of over 2,200 Airmen as well as Joint and Coalition partners. 9 AETF-A and NAC-A is comprised of 2 Air Expeditionary Wings, two Air Expeditionary Groups, two aerial ports of debarkation and an Expeditionary Air Support Operations Squadron. Personnel encompass over 101 AFSCs, as well as nine separate forward and combat outposts in Afghanistan directly engaged in combat supporting Operation FREEDOM SENTINEL and NATO’s RESOLUTE SUPPORT as well as coordinating the development of the Afghan Air Force. Additionally the position advises and assists with Joint Expeditionary Tasked and individual augmentee Airmen in the Afghanistan Combined Joint Operating Area. I joined the Air Force in 1984 under the delayed enlistment initiative; departed Vermont directly after high-school, headed for basic military training at Lackland Air Force (AF) Base, Texas. The experience, opportunity, and diversity was nothing less than priceless. My first duty station was located at Travis AF Base, CA. 60th Military Airlift Wing became my home with many new friends and colleagues. Upon leaving the Active Duty AF, I joined the Vermont Air National Guard (VT ANG). In my opinion, The Green Mountain Boys (GMB’s) are simply the best unit I have ever served with. The opportunities to work in Command and Control, Airfield Management, Operations Superintendent, and Wing Command Chief seems like a dream that I have not yet awoken from. My most interesting story? I could expound on my deployments but I would rather tell you about empowering others to achieve what they deem impossible. The team was granted permission to build, plan, and execute a professional development trip for 60+ members to the Battle of Gettysburg in line with our warrior ethos. The team responsibilities included Air Transportation, billeting, ground transportation, guest speakers from National Defense University, finances, etc. The team provided executive briefs to the Command Element along the journey. The event was a first for the GMB’s that included a four day event and they flawlessly executed the trip. The result included deep relationships for all members. Additionally, the core team learned about mission, resource allocation, leading people, and improving the Wing. Today, these members feel like they can achieve anything, and they did all the work. My heroes reside within the GMB’s. Many stories quickly come to mind but this one resonates with me. Our fire fighters provide mutual aide to five neighboring towns. On this occasion, a tractor trailer plummeted off Interstate 89 in Winooski River Bridge, 25 June 2013. Upon arrival at the scene; three other rescue departments were on site. It was raining very hard, the river had flooded, the truck appeared to be a complete loss, the cab of truck was approximately 70’ below the bridge and the cab was partially submerged. The GMB rescue team rappelled over the bridge down to the truck. The driver appeared at first to have passed; in fact, he was alive. They cut the driver out while rising waters entered the cab of the truck. The crew was able to extract the driver, secure him in a basket, hoist him to the top of the bridge, and transport him to the hospital all within 57 minutes of receiving the initial call. These folks are heroes, and they do it every day! My definition of hero would have to be Rosa Parks. She stood up not only for herself but for those who followed in her footsteps. I sometimes ponder if others understand or grasp her courage and strength to face unbelievable adversity. One does not have to face life or death to be a hero. I hold President Ronald Reagan in a place of high honor. His innate ability for empathy, bravery, diplomacy, and moral character is who I desire to emulate. He is one of my heroes! The most recent Leadership and Life Lessons includes graduating from Champlain College Online with an undergraduate degree. Currently I’m two classes short of acquiring an MBA from Champlain College Online. One of my core beliefs is that I will not levy a requirement on others that I have not completed myself. How can I coach my members on education if I have not walked in their shoes? This has served me well over the years. Education as a whole has changed my outlook on life; we need to seek to understand before making decisions. Champlain College Online and I collaborated to bring awareness to the VT ANG members concerning the truED program. It’s an affordable venue for members to acquire an undergraduate or graduate program online. One of my members who graduated personally informed me that I changed their life by introducing him to this program. He posted his degree certificate, thanked me for the opportunity, and is now an education force multiplier. Champlain College Online has visited the wing to hear the good, bad, and indifferent thoughts of our members. I’m very proud of the cooperative partnership and the opportunity for our future leaders. Everyone is different and we need to embrace diversity. It does not matter if it’s a diversity of education, experience, social status, generational gaps, values, etc. I learned a valuable lesson during one deployment. Everyone handles situation differently, if I could go back and change an event in time, I would have handled the situation much differently. I lost a friend that day, I also learned what it means to be humble. I approach problems and scenarios with a much different diversity of thought. Again, education has completely changed me. Yes, the military prepares you in many venues such as training, education, and experience. Taking care of people is an aspect that must be first. Learning how to provide and receive constructive 360-degree feedback is imperative. Core values in the realm of integrity, team work, respect, and excellence are the building blocks to a great organization. The military prepares through joint experience, cross domains, geo-political, and domestic events such as Hurricane Harvey, Irma, Maria, and Sandy. The ability to shift, to have agility, be scalable, and shape the operating environment is one of core mission. I did not struggle at all, that said, we are all very different and some of my colleagues have struggled. Allow me to add some of the resources available upon return from deployment. Each member has access to Wing Director of Psychological Health, Chaplin, VA, and many other resources. I personally cope with life stressors through physical exercise or the four pillars of health (social, physical, mental, and spiritual). I really enjoy motorcycles and farm equipment. I feel you need to be comfortable in your own skin, be genuine, and don’t be afraid to ask for help. One project that has been placed on hold due to my deployment. A team has been assembled to construct Virtual Reality job descriptions. Millennials and other generational gaps prefer to be immersed into new career fields. The Air Force has greater than 110 different fields of opportunity. The team is constructing a 90 second 360-degree video illustrating vacant positions instead of reading a job description. The team is in the conceptual stage; the equipment has been procured, the filming will begin this spring. Leadership is not difficult, don’t attempt to be someone you not, be comfortable in your own skin, and be genuine in everything you do. Second, invest in professional development for the entire team. Never stop teaching, coaching, and mentoring from the bottom up or top down. Third, never stop fostering relationships. Lastly, seek to understand first and always contemplate the second, third, and fourth order effect of your decisions. First and foremost, build trust in your team. My recommendation is to decentralize command through mission execution. Fundamentally, delegate authority to your team, allow them to grow. Explain the difference between responsibility and authority. Responsibility can never be delegated such as the President of the US. Responsibility is delegated to security members, first responders, etc.